"How I met Your Mother" loves to play with time and temporal markers, meditating on how memory works, and how sometimes, memories can bleed into one another or get mixed up. For example, in episode 3.17 The Goat, we’re introduced, for the first time, to Missy. Missy is a goat brought into Lily’s kindergarten class as a visitor with Farmer Frank, who drunkenly explains to Lily’s students that right after this Missy is going to be slaughtered. Lily, “in a fit of mercy,” purchases Missy and brings her over to Ted’s apartment where she hopes to stash the goat until Monday when animal rescue will come to pick her up. That’s when we get our first shot of Missy the Goat in the bathroom. Future Ted tells us, “…What Missy the Goat would go on to do in that bathroom was so—” and then he stops himself and qualifies, “No, you know what? I’m getting ahead of myself. We’ll get there.” Future Ted is the one telling the story. This is first person POV, and so this kind of thing is okay. It’s credible, and we believe it. We’ll also keep watching to find out what the deal is with the goat in the bathroom. 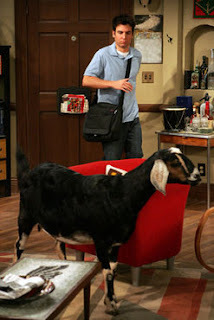 “The Goat” is a turning point episode, in that Ted experiences some serious emotional trauma after learning that Barney slept with Robin and, in turn, telling Barney that he doesn’t want to be friends anymore. 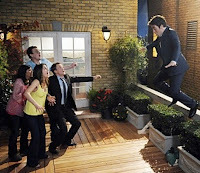 At the end of the episode, Ted arrives at his surprise birthday party by himself, and then the episode does that thing that “HIMYM” does when it’s at its best: it reveals itself to be a narrative that is not only about how Ted Mosby meets the woman of his dreams, but about friendship, love, and loss during those strange transitional years that exist between college and adulthood. After Ted arrives at his party, there’s a shot of Barney, torn, sitting alone in a limousine, empty glass in his hand after having just been dumped by the person who, as we understand it, he values most in this world. We are distracted, because it is sad. We’ve forgotten about the goat. Break. When we return, we get one last shot of the goat in the bathroom. It’s got a pink towel in its mouth, and future Ted is back with this closing bit of voiceover: “Oh, right, the goat! So funny. You’re gonna love this! So later that night, the goat locked herself in the bathroom and was eating one of Robin’s washcloths and—Wait, hold on. Robin wasn’t living here on my thirtieth birthday. When did this happen? Oh, wait. The goat was there on my thirty-first birthday. Sorry I totally got that wrong.” Cue credits. We’re left sort of speechless. Why? Because future Ted has just redacted what we thought was going to be an integral part of the episode. Yes, it seemed integral at first, partly because, well, the episode is called “The Goat,” and also because that shot of the goat in the bathroom kept showing up, and future Ted kept assuring us that, eventually, we’d get there. We’d get to what happened with the goat. We never got there. This feels like a trick, like a gimmick only there for a laugh, but it is, in fact, an earned ending. While we’re waiting for the goat story, what we don’t necessarily realize right away, but what we begin to realize over time, is that this episode is not about the goat at all. 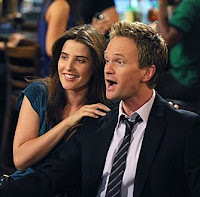 This episode is about the the consequences Barney must face after having slept with Robin, and it’s about Ted’s friendship with Barney. Remember how Ted talks early on about his box of stuff that he doesn’t need anymore? Well, that turned out to be foreshadowing, as he later groups Barney in with the stuff in that box, and now, instead of thinking about the goat, we’re thinking about Barney and Ted, and their friendship, and what this means for next week’s episode. So we may be surprised in the end, but we’re not too disappointed, because the narrative has successfully distracted us from the goat. Future Ted has forgotten, too, about the goat, as he’s telling the story. We know this, because in the end we get an “Oh, right. The goat!” and that’s when we learn that it’s all been a big mistake, the goat is next year, and now we have to wait a long time to get the exciting conclusion. That’s alright, though, we’re not concerned with the goat. We’re concerned with Barney and Ted. Here’s an instance of two memories that bleed together in future Ted’s retelling, but it’s not enough that they just bleed together. Again, this is is not a gimmick, and I think it might be safe to argue that the reason these memories bleed together is thematic in nature, and that they have much more in common than the simple fact that they both take place around Ted’s birthday. Both The Goat and the episode in which the goat narrative wraps up, season four’s finale The Leap, deal with Barney and Robin’s relationship—The Goat being the catalyst, and The Leap being, well, the leap, and the fruition. They get together. Sort of. That’s not the point. These two episodes deal with Ted at great milestones in his young adult life. Ted is our guy, but he’s obsessed with compartmentalizing, and he wants to plan everything, and he wants everything to go to plan. In fact, it makes total sense that, twenty years from now, Ted Mosby sits down with his two kids and proceeds to tell them the ENTIRE story of how he met their mother, because that’s how Ted works. He obsesses, and he is meticulous. He’s an architect. He plans things, and, well, he’s kind of a romantic, but he’s also naïve. Both The Goat and The Leap meditate on Ted’s inability to control the world around him. In The Goat, he decides not to be friends with Barney anymore after Barney sleeps with his ex-girlfriend, breaking the bro code, and defying Ted’s expectations—all of this, regardless of the fact that he’s moved on from Robin, and that Barney actually has feelings for Robin. She was not just a one night stand to him. In fact, Barney’s feelings for Robin are what complicate and pressurize much of season four. Of course, we know that Ted’s decision to dump Barney in The Goat will not be easy, but he makes the decision, like that, and it’s not until later, when Ted gets into a car accident, and Barney is injured trying to get to him, that Ted realizes Barney’s importance as a friend, and that, sometimes, actually being a friend is a little bit more complicated than the list one might make on a piece of paper of the things friends should and should not do. In The Leap, Ted, unemployed and looking for work, is asked by a couple of potential clients to design for them a tourist restaurant in the shape of a cowboy hat. He designs the building after three very hard days, and they reject him. Then, after Ted’s party (which he didn’t attend), his rejection, and the run-in with Missy the goat (goat pay-off…finally! ), the group sits down with Ted to console him, and Lily begins to talk about how things change, and how nobody’s life turns out the way they’d always imagined when they were younger. “I have to be an architect,” Ted says. “That’s the plan.” “Screw the plan,” says Lily. “You can’t design your life like a building. It doesn’t work that way...Listen to what the world is telling you to do and take the leap.” Then, there is the actual, proverbial leap, when everybody literally jumps from Ted’s roof over to the better-furnished roof nextdoor. Hey, this is a great show! Essentially, these memories bleed together in the retelling, because they both deal with similar plot and thematic milestones for Ted, and since this is future Ted’s story, we’re sort of at his mercy. Also, this type of overlapping of memories and events (which actually happens a lot in “HIMYM”) simply goes on to create an ever larger, more credible, three-dimensional world for these characters to run around in. 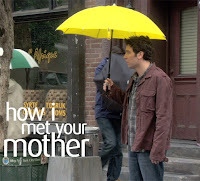 What’s so great about all of this, is that Ted Mosby, our protagonist, is an architect who, at every pass, attempts to design his own life (like Lily said), but the structure of the show "How I Met Your Mother" is entirely based on memory, and it is often told in a way that is, in fact, non-linear. Future Ted is always sort of getting lost, mixing things up, exagerrating, and outright changing things. It’s like the structure of “HIMYM,” or the outcome in the retelling, is a a manifestation of its character’s goals, and of the show’s central theme, which I think Lily lays out rather plainly for us in The Leap: “You can’t design your life like a building. It doesn’t work that way. You just have to live it and let it design itself.” And that’s what memory is. Memory is not what really happened. It is, in fact, quite different than reality. It’s a perception of what happened, dependent on us and how observant we are, what we do and don’t remember, how we remember, why we remember certain details over others, and memory sort of redesigns and reimagines itself as we get older and farther away from the thing we’re trying to recall. “HIMYM” is doing the same thing: constantly reinventing itself, changing its story, creating elaborate schemes in which memories are intertwined and updated in new and challenging ways. It’s why we keep watching. It’s why we love it so damn much. Authority Rules: The Merit of "Glee"
Christmas TV Episode #1: "Smallville"
Christmas TV Episode #2: "Party of Five"
Christmas TV Episode #3: "The West Wing"
Christmas TV Episode #4: "Supernatural"